Founded in 1963 as part of the City University of New York (CUNY), Kingsborough Community College remains firmly committed to its mission of “providing both liberal arts and career education…[and] to promoting student learning and development as well as strengthening and serving its diverse community.” Kingsborough combines the best of what a college can offer. Its tranquil seaside location is a perfect setting for reflective academic pursuits, yet the college’s active engagement in the community provides students with exciting opportunities to become productive participants in a growing and vital borough. Kingsborough has been named one of the leading community colleges in the country by the Aspen Institute College Excellence Program. It has also earned national recognition for its creative and effective use of learning communities, for the large number of degrees it confers, for the high percentage of graduates who continue their studies, and for the innovative programs that draw thousands of non-traditional students to its campus every year. Kingsborough serves a widely diverse population of approximately 14,000 students and consistently ranks among the leading community colleges in the country in associate degrees awarded to minority students. Approximately 70% of Kingsborough’s students are enrolled in a liberal arts or science degree program; the rest pursue degrees in more specialized, career-oriented programs such as business, communications, criminal justice, culinary arts, nursing and allied health careers, information technology, journalism, maritime technology, tourism and hospitality, and the visual arts. It also maintains one of the most comprehensive adult and continuing education programs in New York City. The college takes pride in its many support programs that enhance student success. All students are offered individual, personal and academic counseling; workshops to improve basic skills; and career planning and placement. Students enjoy the accessibility of Kingsborough faculty and administrators. Kingsborough is a major presence in the bustling borough of Brooklyn and has partnered with dozens of schools borough-wide to create a seamless transition to college. Kingsborough also sponsors numerous activities year-round to meet the professional, recreational and cultural needs of the community, including lectures, concerts, art exhibits and theater productions. Was identified from the nation’s 1,200 public community colleges by the Aspen Institute College Excellence Program as among the top 10% of community colleges in the country in in 2011 and was selected as one of the top four community colleges in the country in 2013. Has received national recognition for the success of its freshman year Opening Doors Learning Communities program and has built on that initial success to expand the use of learning communities in later semesters and additional disciplines. Kingsborough has shared its learning communities model and methods with many institutions through workshops and at professional conferences across the country. Is demonstrating its leadership in civic learning by having established a college-wide civic engagement graduation requirement and by participating in national civic engagement organizations and research projects. Employs an academic calendar that is divided into two semesters, each consisting of a 12-week and a 6-week session. Full-time students who are NYC residents and attend the 12-week session may attend the 6-week module without additional tuition. Advantages include the ability to focus more intensively on developmental education programs or to accelerate academic progress. Is consistently ranked by Community College Week as one of the leaders among community colleges in the number of associate degrees conferred in Business, Communications, and Education, and in the total number of minority graduates. In 2013, it ranked 11th for African-American graduates, 24th for Asian-American graduates, and 15th for all minorities. Offers an Honors Program that affords high achieving students an opportunity to participate in a rich menu of co-curricular activities on- and off-campus to enrich their education. The college is also home to one of the largest chapters of Phi Theta Kappa, the international honor society of two-year colleges. Offers continuing education programs to over 20,000 students each year from ages six to seventy plus. Courses target occupational, academic, and personal development. Kingsborough offers 38 associate degree and 4 certificate programs. Of the approximately 15,000 degree-seeking students, about 70% are enrolled in liberal arts or science degree programs and the remainder pursue degrees in more specialized, career-oriented programs. More than 70% of Kingsborough graduates go on to pursue a baccalaureate degree. The college has articulation agreements with most City University and State University senior colleges, and transfer agreements with several private colleges in the region. Kingsborough Community College is fully accredited by the Middle States Commission on Higher Education. The Commission on Accreditation in Physical Therapy Education accredits the Physical Therapist Assistant Program. The Surgical Technology program is accredited by the Accreditation Review Council on Education in Surgical Technology and Surgical Assisting. All academic programs are registered by the New York State Education Department. The college has a full-time faculty of 363, 82 percent of whom hold a doctorate or University equivalent. Adjunct faculty, drawn from throughout the New York City metropolitan region, number approximately 600. Professional staff and full-time and part-time support staff total 1,000. The college enrolls approximately 14,000 degree seeking students on campus. The student body is racially and ethnically diverse. More than half of Kingsborough’s students were born outside the U.S., representing 142 different countries and 73 different native languages. Sixty percent are the first generation in their families to attend college. Fifty-eight percent are full time students, over one-fifth are 25 years old or older and more than 40% come from households with annual incomes of under $20,000. Half of the students work full-time or part-time while attending college, and one in five supports children. A broad array of student services permits all students to succeed to the maximum of their abilities. Beyond their academic pursuits, Kingsborough students enjoy a wide range of co-curricular and extra-curricular activities. There are over 50 active student clubs and organizations and 10 intercollegiate athletic teams in which students participate. The Academic Village, which houses the Village Center for Enrollment Services. The Village is Kingsborough’s “one-stop” for providing services related to admissions, financial aid, and the registrar, as well as the Single Stop USA office, which connects students to benefits and resources for which they may qualify. The Academic Village also includes classrooms, computer labs, early childhood education workshops, and a child care center. 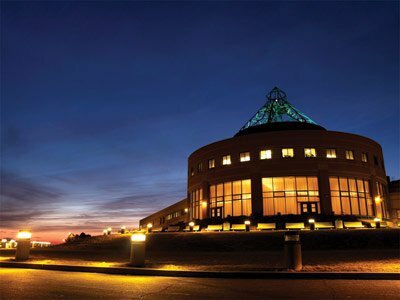 The Marine and Academic Center (MAC), whose iconic beacon is a registered point of navigation, houses a 12,000 square foot conference facility that is the site of numerous college, community, and university-related events; classrooms; computer labs and cyber lounge; state-of-the-art nursing labs; an aquarium; and the Honors House. The MAC is also home to two very important faculty development resources – the Kingsborough Center for Teaching and Learning and the Kingsborough Center for Advanced Technology Training. The Robert J. Kibbee Library and Media Center, with a high-quality collection that includes more than 420,000 reference and circulating books in print and electronic formats; over 75,900 online periodicals; more than 25,000 bound periodicals; and over 10,400 micro-films. A marina and ocean-going instructional vessels used by the Maritime Technology program. A gymnasium and indoor pool. The 743-seat Leon M. Goldstein Performing Arts Center and the 300-seat Marine and Academic Center Playhouse. A 1,600 square foot art gallery. Eighteen general purpose instructional computer labs with more than 500 work stations and approximately 200 computer work stations in specialized instructional facilities. A computerized testing facility with more than 150 stations. An 800-student capacity NYC Department of Education high school. State-of-the-art labs for both our nursing and paramedic programs, replete with high-fidelity simulation mannequins and a fully equipped ambulance. A digital TV studio and FM-radio station. A 1,600-square-foot Urban Farm that produces fresh vegetables for use in class by culinary arts students.